There are currently 150 people online. EVGA revealed a closeup of an upcoming X79 based motherboard. 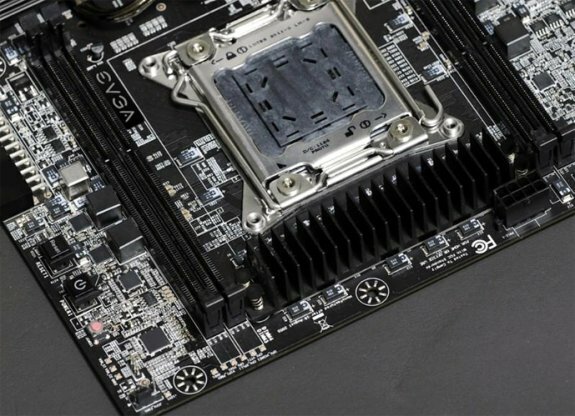 In the image above, you can see that EVGA is preparing the identical layout as the other X79 motherboards: LGA2011 Socket lies in the middle with two DIMMs on each side. In order to enable Quad-Channel i.e. 256-bit memory controller, you need to populate all four DIMM with memory modules. DDR3-1600 memory modules will result with theoretical system bandwidth of massive 50GB/s, DDR3-1866 yields 58.3GB/s and those able to run the memory stable at DDR3-2133 should achieve 66.6GB/s.